Batutumonga is one of tremendous tourist destinations in Tana Toraja, South Sulawesi. Batutumonga is located on the slopes of Mount Sesean which is the highest mountain in Toraja. The mountain is crowned as the best place to watch the beauty of Tana Toraja from the height including the panorama of Rantepao City. When in Batutumongga, you can breathe in the very fresh mountain air while enjoying the scenery that stretches underneath. The tomb stones that scattered, traditional houses and rice fields that extend into a spectacular sight are the things to stare at Batutumongga. From the distance, we can see the span of Rantepao City, the capital of North Toraja district which is also the entrance to this fertile and prosperous land. 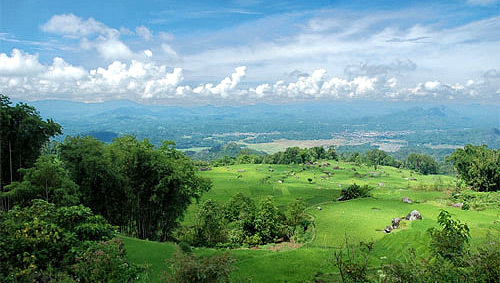 The distance to Rantepao is approximately 20 km, or 1-1.5 hours’ drive away. Without being too much, the morning in Batutumongga, the fog and set of pure white clouds that wrapped the sky in Tana Toraja will present the impression as if you were in the land of the clouds. All those charm of the sights you can enjoy while sipping a warm Toraja coffee or snack at the coffee shop that seems to know for sure from the point where the most beautiful scenery can be looked at. Some home stay is also available in Batutumongga, ready to welcome those who want to spend the night in the silence of nature beautiful. The sound of the crickets may be the only song that you want to hear at night in Batutumongga. To go to Batutumongga, there are two options of transportation that can be used. First, by taking minibus, this can be found in the Market Bolu. Second, rent a car that will take you to the location. Hiking trips to Batutumongga is not easy with uphill and winding road. However, after arriving at the place, those struggles will paid off, and it approximately can be reach by 1-1.5 hours’ drive.